Huh? Yep. You heard me right. Pee on a rock. How will that help you make better pictures? It’s simple really, but before I explain that I should confess, the whole pee on a rock thing was just a gimmick to get your attention. It worked didn’t it? Peeing on the rock probably would have had much the same effect as pouring water on it. Who knows, maybe it would have done better, but I had plenty of water with me, the rock was along a trail, and I don’t think it would have been the most pleasant experience to be so close to a rock that had just been peed on. All good reasons to use water, but under other circumstances pee probably would have done the job. Because you can’t always predict with accuracy how wetting down your subject will effect it, take a shot before you do. In my experience it’s a lot harder to dry off a rock than to wet one. So, when you want to try adding a little more color to your subject, you know what to do. Just make sure nobody’s looking! 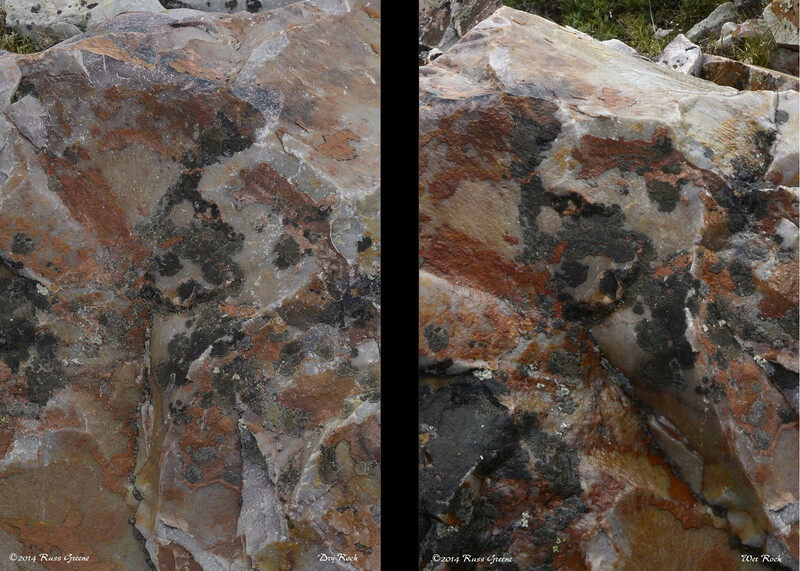 Here you can see the difference in the saturation of colors created by wetting the rock (image on right). Click on the image for a larger version.